PARAMARIBO, Feb 14 2019 (IPS) - At 51, Roberto Wong Loi Sing has spent nearly half of his life working in the field of engineering. But as he spends his days designing more efficient stormwater management systems, or water purification systems, for instance, the child in him comes alive as he combines his skills to find “win-win” solutions for the environment. 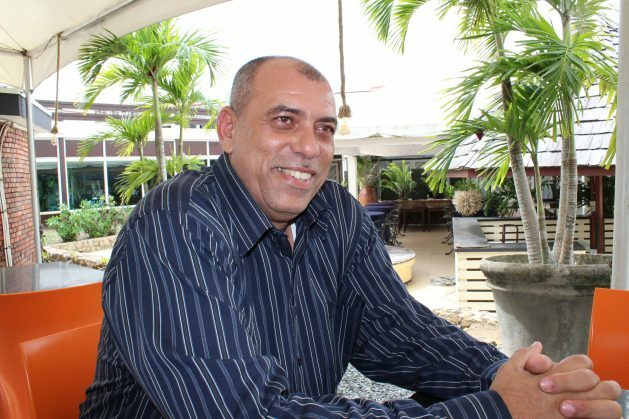 He currently serves as the Leader of Projects at ILACO—an engineering firm in Suriname which is active in a wide range of studies and planning of development projects, among other things. The firm is also one of the local sponsors of a major international conference on climate financing for High Forest Cover and Low Deforestation (HFLD) countries, which the Caribbean nation of Suriname is hosting. Wong Loi Sing, who spoke with IPS on the sidelines of the conference, says technology has a very crucial role to play in fighting climate change and deforestation. At the macro level, he says technology can also help big polluters in the world reduce their pollution and become much more environmentally friendly. “On a large scale, we, as experts in the field of technology, definitely have to take the lead role—not politicians, not economists, not financiers—but technologists, engineers, the scientists. [We] should make it so attractive for investors to be willing to invest in cleaner technology, greener technology,” Wong Loi Sing tells IPS. “You have to invent. Your mind is the biggest asset that you have, and we are able,” he affirms. Trinidad & Tobago-based KVR Energy Limited is one company that has taken military technology of Forward Looking InfraRed Optical Gas Imaging (FLIR OGI) and found innovative uses for it—such as using it to find hazardous gases. The company uses an optimal gas imaging camera, which is considered a highly-specialised version of an infrared or thermal imaging camera, to find gas leaks “which would be otherwise impossible to find using conventional methods,” KVR’s regional manager Vikash Rajnauth tells IPS. “The technology is not new, it has been used for military and defence, but this aspect of it is very special because it uses a specific tuning of a detector to find hazardous gases. We have worked on a methodology to use footage from the camera to quantify this gas . . . so this way we can put an actual dollar value to it,” Rajnauth says. Most importantly, Rajnauth says they can also now put a value as to how many credits companies are using by producing hazardous gases and emitting them into the environment. He explains that his company has already implemented the technology at British Petroleum (BP) and Shell, noting that they were able to get Shell in Tunisia to come onboard long before getting buy-in for the technology from Shell in Trinidad & Tobago. “At the end of March this year, we will be entering into our first exercise with the Atlantic LNG facility in Trinidad to quantify gas leaks,” Rajnauth says. But he also admits the technology does not come cheap. “It has a spectral filter inside the camera. It also has a cryogenic cooler that cools a FLIR Indium Antimonide (InSb) detector inside the camera down to -321 degrees F. The technology is not cheap, but it pays back for itself in no time when we consider loss of containment, prevention of catastrophic failures and harm to the environment,” Rajnauth says. Meanwhile, information technology consultant Camille Pagee points out that there are low-cost solutions available to countries in the Caribbean to use to collect data as they address climate change. 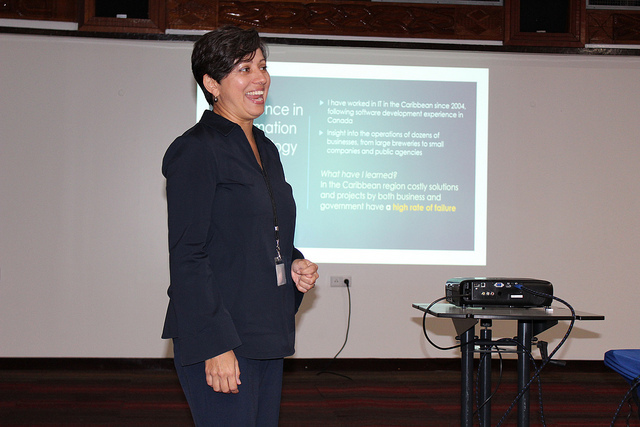 Pagee, the Managing Director at Connect Consulting Limited, has worked in IT in the Caribbean since 2004, following software development experience in Canada. Over the years she has gained experience in dozens of businesses, from large breweries to small companies and public agencies. She says that in the Caribbean region, costly solutions and projects by both business and government have a high rate of failure, and she recommends that countries use the tools they already have at their disposal and to also start on a small scale. “The truth is that climate finance is a subject that is very abstract, but it’s founded 100 percent on data. We are speaking as the HFLD countries and stating that we’re delivering a service and we’re demanding that services have a particular value,” Pagee tells IPS. Pagee says she has found that there are two main myths that have contributed to the high rate of failure of IT projects. The first is that collecting data is a very technical exercise. Using her own company as an example, she says they have collected data from around the Caribbean trying to make use of simple every-day tools. “We conduct face-to-face surveys to collect primary, real, current information about a range of things. It could be public opinion, it could be state of projects, it could be impact,” she tells IPS. Pagee says the second myth is that data collection is a technical activity and complex projects require complex and advance project structures. But she says most people, even in developing countries and HFLD nations are already preparing to collect data. “We’re not lacking any of the tools. I am calling on those who are in a position to make decisions about big projects, especially relating to data which is especially related to the success of climate financing, climate measurements and carbon measurements – let’s think about the importance of small steps and small projects, community level activities,” Pagee says. “Data is a product which continue to have value. It doesn’t lose the value if you collect it in small portions compared to collecting it in large portions. It all tells you the reality of your process, the success of your business efforts,” she adds.